Reality Check: As the above news story from 2011 shows, even paying for the direct murder of preborn children does not suffice to get oneself deposed, excommunicated, or even so much as simply punished by the New Church (that only happens to those who reject Vatican II). One can, furthermore, have a scandalous relationship, endorse homosexuality, favor "priestesses", and reject clerical celibacy and yet still "continue to lead a ... parish". Welcome to what the Ven. Anne Catherine Emmerich rightly called the "Church of Darkness". Pousa's claim that he was merely 'counseling the lesser sin' is laughable on its face. He did not talk anybody into committing fewer sins, he actually provided the funds to hire a professional assassin to directly kill the preborn children. His rationalization is akin to arguing that it's OK to drive a madman to a school so he can go on a shooting rampage on the grounds that he would have done it anyway and this way at least he wouldn't be endangering his own life in the process. Despicable. "Faith does not mean a believing-to-be-true of wonderful facts and sets of beliefs that have authoritatively been put before us." "Dogmas can certainly be one-sided, superficial, bossy, dumb, and rash." Christ "presumably did not call himself either Messiah or Servant of God or Son of God and probably not Son of Man either." The dogma that Jesus is "completely man and completely God" is able to be superceded. Kasper writes "that we must call the many miracle stories in the Gospels legendary." Even when [if] Kasper admits Jesus performed healings: "On the other hand, with some probability one need not consider [the] so-called miracles of nature as historical." The Resurrection of Jesus is "no objectively and neutrally ascertainable historical fact." Regarding the oldest account of the Easter event (Mk 16:1-8), Kasper comments "that here we are not talking about historical characteristics but [linguistic] means of style which are to get people's attention and create tension [suspense, excitement]." Other New Testament factual claims about the Easter and Ascension accounts, too, are mere "means of style" for Kasper. Statements about the immanent Trinity or about the pre-existence of Christ are, according to Kasper, "not direct statements of faith but theological statements of reflection." Kasper also speaks of the "Resurrection of each individual in [at] death." Hence "any talk of life after death is misleading." In addition, any talk of heaven, hell, and purgatory is "a very inappropriate, indeed misleading way of speaking." By the "not very fortunate expression 'infallibility of the Church'" is meant "that the Church . . . cannot definitively fall back to the status of the Synagogue and cannot deny Christ definitively." The dogma of the Church's universal mediatorship of salvation, clothed in the words "extra ecclesiam nulla salus" ["no salvation outside the Church"], which is most important for ecumenical dialogue, Kasper calls a "most misunderstandable phrase." The so-called "Jansenist Crucifix" is defined as a "crucifix in which the arms of our Lord are not extended at right angles with His sacred body, but are contractedly suspended from the cross-beam parallel with the upright portion of the cross. The symbolism of the outstretched arms is that Christ died for all men; that of the Jansenist crucifix, that Christ died only for the elect" (Frederick George Lee, A Glossary of Liturgical and Ecclesiastical Terms, s.v. "Crucifix, Jansenist" [London: Bernard Quaritch, 1877], p. 103). (This is not to be confused with the "for many" vs. "for all" issue in the Canon of the Mass - the Catechism of the Council of Trent clarifies: "...if we look to its value, we must confess that the Redeemer shed His blood for the salvation of all; but if we look to the fruit which mankind have received from it, we shall easily find that it pertains not unto all, but to many of the human race".) When Paul VI died in 1978, his successor John Paul I retained the ferula, and John Paul II used it pehaps more frequently than anyone else. Benedict XVI used it as well, though not as often. More images can be found on Pinterest. Tragically, the hideous Scorzelli cross is also attached to many Rosary beads among Novus Ordos, and probably even some traditional Catholics unwittingly use it, not realizing what an affront to Our Lord it is. Scorzelli's Tomb Stone - with the same "Cross"
Vatican Web Site's Explanation of the "Pastoral Staff"
"Blessed" Paul VI - Just how "Catholic" was Giovanni Battista Montini? (Anti-Pope) x 2 "Pope" Francis Meets Former "Pope" Benedict XVI, Says "We Are Brothers"
Supreme Irony: Neither of them is actually the Pope! Vatican News: "We Are Brothers"
Catholic News Agency: "Francis and Benedict Meet as 'Brothers'"
Refinishing the Great Facade: The Vatican, the SSPX, and the "Restoration of Tradition"
The Chair Is Still Empty: Response to John Salza on the "Errors of Sedevacantism"
Could this be the REAL Third Secret of Fatima? Canadian Novus Ordo Priest picked by Vatican for Conclave Reporting utters Heresy, says Pope is mere "Figurehead", "First Among Equals"
But, wouldn't you know it, "Fr." Rosica is by no means alone in his adherence to this damnable heresy. He simply repeated Ratzinger doctrine, as Joseph Ratzinger ("Pope Benedict XVI") himself explicitly denies the dogma of Papal Primacy in his 1982 book Principles of Catholic Theology (a work that contains neither principles nor Catholic theology, by the way): SEE HERE. Plot to Assassinate Benedict XVI? Investigative Dossier by "Cardinals" Herranz, Tomko, and De Giorgi Reportedly Includes Confidential Letter from Vatican Official describing "Presumed Plot to Kill Benedict"
Curious: German Magazine Compact already reported on alleged Assassination Plot against Benedict XVI back in July 2012! This insistence that the traditional priests not only get in line with Modernist Rome’s teaching on the “new Mass”, but also prove that they’re in line with it by “celebrating according to the new books” is nothing new. The Society should know that history better than anyone, for a provision of the 1988 “Protocol of Accord” that then-“Cardinal” Ratzinger had SSPX founder Archbishop Marcel Lefebvre sign (but which His Grace later renounced) was that he “recognize the validity of the Sacrifice of the Mass and of the Sacraments celebrated with the intention of doing that which the Church does and according to the rites indicated in the typical editions of the Roman Missal and the Rituals of the Sacraments promulgated by Popes Paul VI and John Paul II” ("Protocol between the Holy See and the Priestly Society of St. Pius X", May 5, 1988). And subsequent to the protocol, every group of traditional Catholic priests defecting to the Novus Ordo Church without exception -- from the Fraternity of St. Peter in 1988 up to the latest defectors, the former Transalpine Redemptorists in 2008 -- would not only be required to accept the false liturgical reforms, but to seal that acceptance with concelebrated Paul VI/Bugnini “Masses”. So there’s absolutely no excuse for Bp. Fellay in this regard... except that he’d been led to believe that somehow things might be different this time. …if for a few months—because of some information he had received from the inner circle of the pope—Bishop Fellay had believed that the Holy Father was willing to accept us exactly as we are, without having to accept the errors of the Council and the New Mass, it is now clear that such is not the case, that the Holy Father wants us to accept Vatican II. As Benedict’s subsequent letter would bear out, Mr. Vennari’s instincts proved to be much sounder in this than Bp. Fellay’s wishful thinking. Unfortunately, Mr. Vennari’s opinion counts for nothing in the Society of St. Pius X while Bp. Fellay’s counts for everything, and his intention is to resolve any difficulties with the Vatican, if at all possible. Although Mr. Marshall is far from the first to be perplexed at the Society’s illogical (and doctrinally disastrous) position, his comments neatly sum up the dilemma: That the Modernist Conciliar “Church” was created out of Vatican II and isn’t Catholic “all makes perfectly logical sense”, until Bp. Tissier tries to force a syllogistic square peg into a round hole by positing, in so many words, that “The Conciliarist Bishop of Rome is the pope of the Catholic Church.” For Mr. Marshall to conclude “I don’t understand it” is perfectly reasonable, for there is nothing to understand here: It’s a position that’s downright silly and doctrinally dangerous, the theological equivalent of 2 + 2 = 5. It is futile to pretend, as the Society does, that somehow “Pope” Ratzinger is simultaneously a Modernist and a Catholic— such a creature does not exist, any more than a figure could be a circle and simultaneously a square. Ratzinger’s Modernism is notorious (that is, open and well-known or manifest), else Bp. Tissier (and we all) wouldn’t be aware of it; hence Benedict is an open apostate and so not a member of the Church, ergo not Pope (in addition, he falls under the excommunication of Pope St. Pius X mentioned above). As St. Robert Bellarmine, a Doctor of the Church and author of the foremost treatise on the Papacy, wrote: “...a Pope who is a manifest heretic, ceases in himself to be Pope and head, just as he ceases in himself to be a Christian and member of the body of the Church...” (De Romano Pontifice, Book II, Ch. 30). In short, it is impossible to have a Roman Catholic Pope who doesn’t profess Roman Catholicism. The stark reality of the situation is that the SSPX has invented a novel definition of the term “Modernism”, though they would never concede as much, for as has been noted here, it is impossible to speak of someone being both a Catholic and a Modernist, for to call a Catholic a Modernist would be a great calumny, while to call a Modernist a Catholic would be to besmirch the faithful. In the final analysis, Bp. Tissier’s “stumbling block” allusion is also apropos of the Society’s position on the Conciliar “Popes”. As indicated above, the SSPX description of the Novus Ordo Church as a non-Catholic sect emerging from Vatican II is solid. However, as they seek to carry the argument across the rhetorical finish line, in their nonsensical attempt to somehow excuse the Chief Modernist unlawfully occupying the Chair of Peter, they stumble over their own faulty logic. Unfortunately, upon this delusion is predicated the whole basis of the “we can discuss things with the Holy Father” insanity, an insanity that attracts Bp. Fellay in much the way that a moth, heedless of the danger, is drawn to a flame; an insanity that still may lead to the auto-destruction of the SSPX. Ultimately, if these doctrinal talks are ever brought to a successful conclusion (that is, successful according to the aims of “Pope” Ratzinger), it will bring an end to the Society in all but name (and even that could change, much in the way that the "Transalpine Redemptorists" were forced to switch to "The Sons of the Most Holy Redeemer", after they took the plunge), which will push countless souls to intimate involvement with the Modernist sect. As a result, they will undergo a gradual “reeducation” that will, at first perhaps only imperceptibly, make them embrace the phony “Catholicism” of the Vatican II religion. Some have argued that the “Pope issue” isn’t the only important one in evaluating the crisis in the Church, and that’s true as far as it goes. But it’s also true that understanding the current status of the Holy See vis-à-vis the entire Church is the linchpin for fully understanding the nature of that crisis and how we must react to it, because without that understanding, all efforts of restoration are doomed to fail. (For what we see today is a negation of the age-old axiom of the Faith, "ubi Petrus, ibi ecclesia", or, “Where Peter is, there is the Church.”) As long as the foremost leader of enemy forces is seen as the Pope of the Roman Catholic Church, who, although “confused” on some points of doctrine and “careless” in his choices for the top positions, still is kindhearted and works tirelessly for the good of the Church, even trying to put an end to enmity with traditional Catholics, there will be nothing but continued confusion of the most vital questions facing the faithful, and the ever-present danger of capitulating to a Modernist usurper and embracing doctrinal error. Let us pray that recent events within the Society of St. Pius X will help its leaders arise from their stumble, and henceforth avoid this logical pitfall and take a much more forthright and doctrinally sound stand against the false Vatican II religion and its equally false pontiff. Of the various reasons the Catholic Church down through the ages has insisted on Latin as the language of her Roman rite liturgy has been the variability of vernacular languages, and hence the reliability of them to consistently preserve word meanings. When one is dealing with unchangeable eternal truths, it is crucial to be certain that the way those truths are expressed cannot deviate in meaning, which is all too easy to do when a living language is being used as witnessed in the "New Mass". Society of St. Pius X Bishop Richard Williamson is as familiar with the concept as anyone, and has no doubt alluded to it numerous times in sermons, addresses, and writings down through the years. He of all people, then, should understand the importance of preserving the form and essence of our communications with one another. Given this background, it may surprise some readers to discover that Bp. Williamson has taken huge liberties in this regard when commenting on the upcoming talks between the SSPX and Modernist Rome. His remarks appear in his Eleison Comments CCXIV ("Greek Gifts I") and CCXV ("Greek Gifts II") for August 20 and 27, 2011, respectively. Clear minds recall the saying of the wise -- but scorned -- Trojan who did not want the Greeks' Horse to be brought into Troy: "Howsoever it be, I fear the Greeks, even when they bear gifts." But the Trojan Horse was brought in. We all know what happened to Troy. In that famous ruse, the Greek army after failing at a lengthy siege of the fortified city of Troy, pretended to retreat and left a huge wooden equine effigy outside the gates of the fortified city as the "gift" of an unsuccessful foe. Against the protestations of a skeptical wise man, a spy convinced the Trojans to bring the horse into the city, after which Greek soldiers, who had been hiding inside the hollowed-out horse, emerged under the cover of night and easily conquered the unsuspecting city from within. Of particular note, in his later book von Hildebrand explains why in just three short years he's changed his rhetoric a bit (from the clandestine "Trojan Horse" to a somewhat more-in-the-open concept like "fifth column"). As von Hildebrand accurately remarked, any perceptive onlooker could, like the wise man of Troy, see that there was a malevolent force behind the destruction, a conspiracy consciously seeking the systematic destruction of its enemy. And this understanding of term has not changed from the first mention of the Trojan Horse five centuries before the birth of Christ up until the present. No change, that is, until Bishop Richard Williamson decided to play fast and loose with the English language. Deceivers with "sincerity and good will"
…one need not at all call in question these Romans' sincerity and good will. There, in fact, is the problem! After nearly 500 years of Protestantism and Liberalism our age is so confused and perverse that the world is now full of people doing wrong even while being convinced that they are doing right. And the more convinced such people are that they are doing right, the more dangerous they can be, because with all the more force of subjective sincerity and good intentions they push towards doing objective wrong, and they pull others with them. The more sincerely today's Romans are convinced of the rightness of their Newchurch, the more efficaciously they will destroy the true Church. So, clearly, the saintly pontiff would not us have us view these people as misguided crusaders, who are simply off a bit in terms of their orientation, but are the "most pernicious of all the adversaries" of Christ and His Church, "full of deceit" who knowingly seek to "utterly subvert the very Kingdom of Christ", and who must be immediately defeated because they remain hidden in the Church's "very bosom", where they do more harm than if they were open in their apostasy. The contradictory positions espoused by Bp. Williamson in his comments can be summed up in this paraphrase of the Wizard of Oz: After first warning of the Trojan Horse and of how we ought not trust those who bring such a gift, he turns around and does violence to the phrase, declaring: Pay no mind to those men exiting the horse, they mean you no harm! Fear not, as they're merely disoriented, confused and mistaken by the age in which they live, so any attacks coming from them are purely coincidental and unintended. Anyone who professes all the tenets of the Faith in the sense that the Church understands them, is a Catholic; anyone who rejects even one dogma is not a Catholic at all. One can no more be partly Catholic than be partially pregnant or in a partial state of grace -- one either is or isn't. To say otherwise is either to be totally out of touch with essential Catholic truths or to be dealing in sophistry. So, it is sheer drivel for Bp. Williamson to maintain that the men he perceives to be the highest authorities of the Catholic Church, including Popes, do not possess the true Catholic Faith, yet remain Catholics in good standing. Of course, this is the crux of his "liberal dream" nonsense, because the only way he can defend the idea that these men are Catholics with rightful authority in the Church, is to invent a cockamamie excuse for how they can simultaneously not have (much less profess) the Faith and yet still be members of the Church somehow. In the end, the Society of St. Pius X is teaching its followers that the counterfeit church is the true Church that just needs some tweaking, and that false Popes are true Popes who are "disoriented". As long as it maintains such a position it puts the souls of its adherents in mortal danger and opens itself up to being eventually absorbed into the Vatican II Sect. In fact, aren't those "negotiations" the prelude to precisely that? 1 Bp. Williamson is right to question the prudence of these SSPX-Vatican meetings, but he does so for the wrong reasons, for there can be no compromises with Modernists, much less a meeting of the minds with them. One cannot sit across the table from them as though they were Catholics. It's time that he start calling a spade a spade a quit acting with cowardice in writing about these men. His Trojan Horse metaphor is a strong one that pointedly gets to the heart of the problem -- would that he have the courage to cast aside his cutesy word games and use it in all its forcefulness to expose the enemies of Jesus Christ and His Church, the very enemies who, in the words of Pope Pius X, seek "utterly to subvert the very Kingdom of Christ" by "systematic and artful undermining of the holy Church", as put by Dietrich von Hildebrand. For only when these men are shown for what they are -- heretical, nay apostate anti-popes -- and are not misrepresented as simply "bad Popes", will this veil of deceit finally be lifted and the restoration of the Church take a decisive step forward. Is this coincidence? The first time Lourdes was severely damaged by flooding was October 21, 2012, the very day that a “relic” of the apostate and false “Pope” John Paul II were scheduled to arrive at the French holy site. We reported the matter back then under the tagline “Talk about raining on someone’s parade”… (see our coverage here – scroll down about one-third of the page). Now, flooding hit a second time, and worse than before, the very same day (June 18, 2013) that the modernist Vatican announced they had approved the second (and final) “miracle” needed to clear the way for the “canonization” of John Paul II as a “saint”. BARCELONA, April 19, 2011 (LifeSiteNews.com) – A Catholic priest who financed the abortion of two young girls in his care will not be excommunicated nor otherwise punished, the Archdiocese of Barcelona declared yesterday on behalf of Cardinal Archbishop Lluís Martínez Sistach. The archdiocese also claims that it has support for its decision from the Vatican’s Congregation for the Doctrine of the Faith, which it says ruled in favor of the priest in 2009. 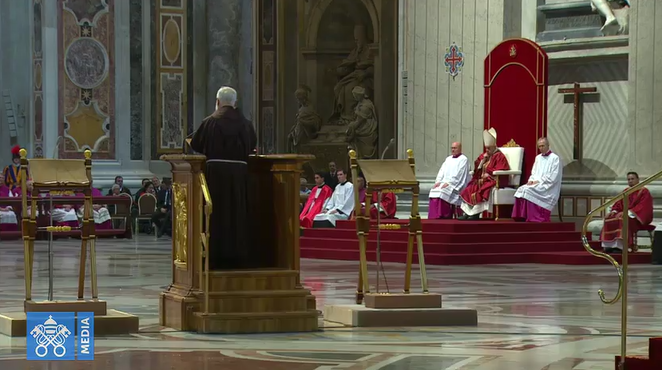 Vatican City, May 2, 2013 / 10:26 am (CNA/EWTN News).- Benedict XVI has returned to the Vatican after moving to the papal summer household outside of Rome to not interfere with the papal election. “He is now pleased to return to the Vatican, where he intends to devote himself, as he announced on Feb. 11, to the service of the Church in prayer,” said a Vatican statement released on May 2. The dogma that Jesus is “completely man and completely God” is able to be superceded. It was bound to happen. Mr. Jorge Bergoglio — whom the world calls “Pope Francis” — has reintroduced the repulsive ‘Bent Cross’ Crozier (sometimes referred to as the “Broken Cross”), after Benedict XVI had, for the most part, abandoned it. The indult blog Rorate Caeli has the story. This sinister-looking cross was designed by Italian Lello Scorzelli (1921-1997) during — you guessed it — the 1960s and was introduced — you guessed it again — by “Pope” Paul VI (Giovanni Battista Montini), who used it for the first time at the closing of his modernist robber synod known as the “Second Vatican Council”, on December 8, 1965. As of 8:00 pm CET, Feb. 28, 2013, it is sede vacante in the Novus Ordo Church — Fr. Joseph Ratzinger has stepped down, has ceased claiming the title of Pope after almost eight years. It’s Two O’Clock: Do You Know Where Your “Pope” Is? Truth: This is a lie. In an interview shown on Canadian television, the Vatican’s man for English-language reporting on the upcoming conclave, “Fr.” Thomas Rosica, has unashamedly uttered heresy against the dogma of the nature of the papal primacy. The video clip is available here; the heresy is uttered at the 7:28 min mark. Fr. Rosica: “[…]The leadership of the papacy requires somebody who can connect with people somebody who has health somebody who can move around and not be afraid of long flights. Vatileaks 2.0 – Plot to Assassinate Benedict XVI? This video gives convincing proof that Fr. Joseph Ratzinger, the false “Pope” Benedict XVI, routinely uses Masonic handshakes when meeting certain high-profile individuals, while shaking hands normally with others. Though the creator of this video is an anti-Catholic Protestant (and therefore does not believe Benedict XVI to be an Antipope of the False Pseudo-Catholic Church but the true Pope of the Roman Catholic Church), this is not relevant to the evidence he gives. The true Catholic Church has long condemned Freemasonry and forbidden Catholics from joining the Masons. This attitude did not change until the death of the last known true Pope, Pius XII (1958), after whom the first of the current Antipopes, John XXIII, took over and began the Masonic revolution with the Second Vatican Council. The strange ecclesial soap opera that is the series of on-again, off-again negotiations between Benedict XVI and the Society of St. Pius X in 2012 took yet another curious turn in mid-September 2012, when the SSPX’s Bishop Bernard Tissier de Mallerais revealed the contents of a confidential letter sent back in the summer by Benedict to Bishop Bernard Fellay, head of the Society. On 30 June 2012 – this is a secret but will be revealed to the public – the Pope himself wrote a letter to our Superior General, Mgr. Of the various reasons the Catholic Church down through the ages has insisted on Latin as the language of her Roman rite liturgy has been the variability of vernacular languages, and hence the reliability of them to consistently preserve word meanings. When one is dealing with unchangeable eternal truths, it is crucial to be certain that the way those truths are expressed cannot deviate in meaning, which is all too easy to do when a living language is being used as witnessed in the “New Mass”.